At present, American citizens and permanent residents of the United States do not need a passport to visit Canada, but should carry a birth, baptismal or voter's certificate, or other documents establishing their citizenship. Naturalized U.S. citizens should carry evidence of citizenship, such as a naturalization certificate. Visitors from other countries must have valid national passports, and visitors from certain countries also require a visa. For a list of visa-exempt countries, go to www.canadainternational.gc.ca. As of Jan. 8, 2007, a U.S. citizen or permanent U.S. resident re-entering the United States by air following a visit to Canada must carry a valid U.S. passport or other secure travel documents, such as a NEXUS Air card when used at a NEXUS Air kiosk. Effective June, 2009, this requirement will be extended to re-entry to the U.S. by land and sea, as well. Newfoundland and Labrador uses the same driving system exercised by the rest of Canada and the United States. Vehicles keep to the right side of roads and highways, and drivers are expected to abide by road rules and regulations. The main exception is on highways where a passing lane ends: the driver in the centre lane must yield to the driver in the right-hand lane. Drivers must carry a valid driver’s licence, Vehicle Registration Certificate, and Proof of Liability Insurance Coverage in order to drive in Newfoundland and Labrador. Legislation requires that motorists carry lump-sum public liability and property damage insurance of $200,000. In case of accident involving personal injury, proof of such insurance must be produced within 24 hours, or driving privileges could be suspended. The driver and all passengers must wear seatbelts and cell phone use is prohibited unless a hands free device is used. A child weighing less than nine kilograms must be secured in either an infant carrier or a convertible car seat adjusted to the rear-facing position. The driver is responsible for ensuring all passengers under the age of 16 are properly restrained by seat belts. Radar detectors are illegal. It is also illegal to drive with a blood alcohol limit exceeding .05 milligrams of alcohol per litre of blood. 4-lane highways and 2-lane sections of Route 1, 100km/h (62 mph); Route 3, 90km/h (55 mph): rural 2-lane highways, 60 km/h (40 mph) or 60 km/h (40 mph); gravel highways, 60km/h (40 mph); in towns and cities, 50 km/h (31 mph); or lower where posted. Drivers using roadways and highways in our province should keep their eyes open for moose. 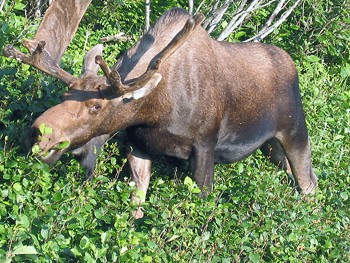 There are about 125,000 moose on the island of Newfoundland, and most highways go through moose habitat. Moose are great to look at – from a distance. If you see one of these large, brown, hoofed animals on or near a roadway, use extreme caution - slow down and prepare to stop. Like all wild animals, moose are unpredictable. Be sure that a moose has gone back into the forest before resuming your drive. Also, if you see a vehicle stopped on or near the highway, the driver may have spotted a moose, so be cautious and slow down. Avoid driving at night if possible as moose/vehicle accidents occur between dusk and dawn. If you must drive at night, slow down. Scan both sides of the highway with your lights on high beam unless you are overtaking traffic, and pay attention to highway signs. A road sign with a picture of a moose or a warning that says “Caution, moose next ‘X’ kilometres” means moose cross there frequently. Caution is also required when driving in winter. Slippery road conditions, drifting, and blowing snow can sometimes make driving treacherous. When road conditions are not optimal, it is imperative that you slow down and use caution while driving. Increase the amount of space between yourself and cars you are following, and be aware of other drivers. During the winter months, all primary highways are kept open except for short periods during or immediately after a severe snowstorm. For more information on road conditions, highway construction and slowdowns, visit www.roads.gov.nl.ca. The island of Newfoundland has a temperate maritime climate. Winters are usually mild with a normal temperature0° Celsius. Summer days range from cool to hot with a normal temperature of 16° Celsius. Good swimming weather begins at the end of June. The normal annual rainfall is 1050 mm and the normal annual snowfall is 300 cm Labrador winters are much colder than those on the island, while summers are shorter and generally cooler, extreme high temperatures are not uncommon. Pitcher Plant (Sarracenia purpurea). Queen Victoria, more than a hundred years ago, chose the Pitcher Plant to be engraved on a newly minted Newfoundland penny. In 1954, the Newfoundland Cabinet designated this unusual and interesting plant as the official flower of the province. It gets its nourishment from insects that get trapped and drown in a pool of water at the base of the tubular leaves. The flower is wine and green in colour and can be found on bogs and marshes in Newfoundland and Labrador. In this flag, the primary colours of red, gold and blue are placed against a background of white to allow the design to stand clearly. White is representative of snow and ice; blue represents the sea; red represents human efforts; and gold our confidence in ourselves. The blue section, most reminiscent of the Union Jack, represents our Commonwealth heritage which has so decisively shaped our present. The red and gold section, larger than the other, represents our future. The two triangles outlined in red portray the mainland and island parts of our province reaching forward together. A golden arrow points the way to what we believe will be a bright future. Surrounded by red to indicate human effort, the arrow suggests that our future is for making and not the taking. But the design of the flag encompasses much more symbolism than this. For example, the Christian Cross, the Beothuk and Naskapi ornamentation. The image of a trident stands out. This is to emphasize our continued dependence on the fishery and the resources of the sea. Hung as a banner, the arrow assumes the aspect of a sword which is to remind us of the sacrifice of our War Veterans. Since the whole flag resembles a Beothuk pendant, as well as all the above, the design takes us from our earliest beginnings and points us confidently forward. It, therefore, mirrors our past, present and future. The flag was officially adopted on June 6, 1980. The flag was designed by artist Christopher Pratt. The Newfoundland Coat of Arms was originally granted on January 1, 1637 to a private company. It was not until 1928 that it was rediscovered and officially reintroduced. The arms consist of a red shield bearing a silver cross with lions and unicorns in the quarters. The supporters holding the shield are European interpretations of Newfoundland's native Beothuk people. An elk, meant to represent Newfoundland's caribou herds, stands above the shield. The Latin Motto, seen on bottom, reads "Seek ye first the kingdom of God". The Newfoundland is a large dog with the size and strength to perform the tasks required of him. It has a heavy coat to protect it from the long winters and the icy waters surrounding its native island. Its feet are large, strong, and webbed so that it may travel easily over marshes and shores. Essentially the Newfoundland dog is as much at home in the water as on dry. Newfoundland and Labrador would rank fourth in size behind Alaska, Texas and California ... if it were one of the United States. It is almost one-and-three-quarters times the size of Great Britain. We are the fourth largest province in Canada. St. John's is the capital of Newfoundland and Labrador. The City's population is 100,646, while the metro area population is about 181,113, population within 100 km (estimate) 250,000.